Placemat embroidery is one image of the bat, moon and stars. 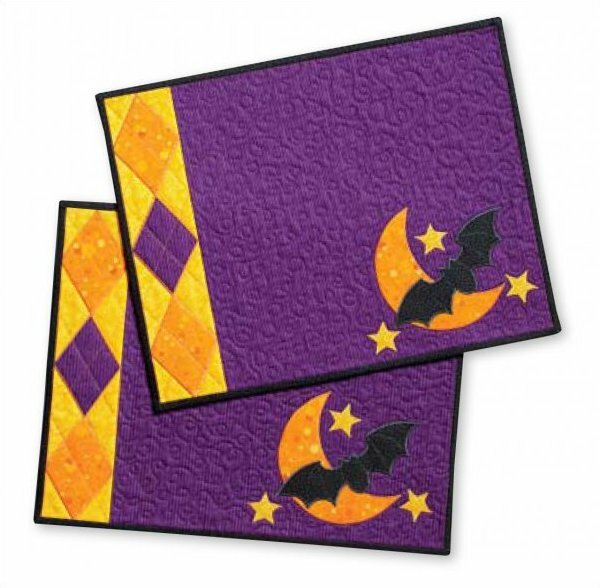 Table topper embroideries are separate bats and stars - Two bat sizes and 3 star sizes. Mug mat embroidery is one image and your machine will stitch the circular outer/cutting edge of the mat. Refer to page 24 of the fall 2012 issue of Quilting Celebrations for instructions and finished sizes of the projects. All of the embroideries you need to make the placemats, mug mats and scalloped table topper featured in the issue. We're sure you can find lots of great additional uses for this collection of bats, stars and a moon.